Its always fun to dance to Bollywood music and this time there are special Belly dance performances. I would love to invite you for our next 'Dine N Dance' event. Come join an fun evening with family and friends. 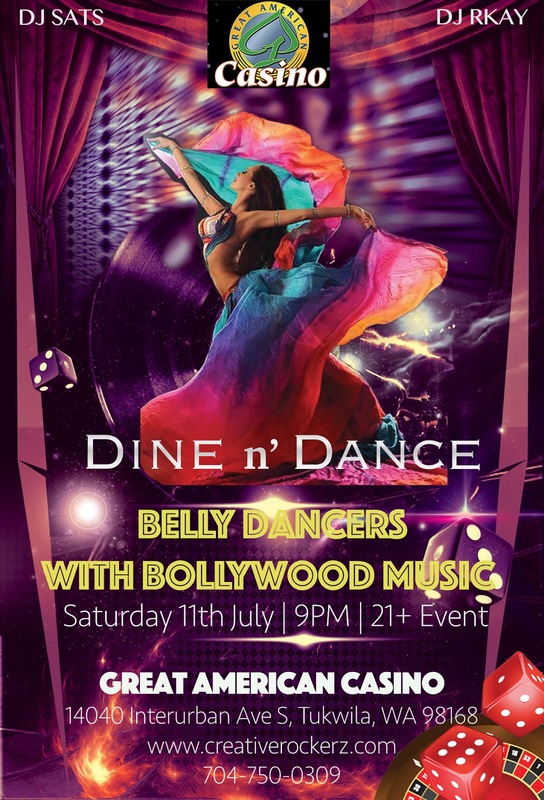 Enjoy the belly dancer's exotic performances while you savor American and Chinese cuisine in the beautiful banquet hall of Great American Casino, Tukwila. From 10PM, our DJs will spin the wheel to popular Bollywood music with electro and house mix. Great American Casino's banquet hall has a large dance floor with plenty of lounging area. Dance your night away or lounge with your friends while you enjoy the music. Click Here to see our last event pictures !